For over 45 years, Winter's has been producing quality products that give customers a real taste of the old-time South. 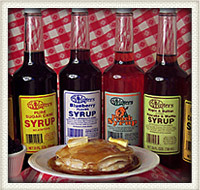 Their syrups are a combination of old-fashioned homemade flavor and gourmet taste. From pure cane syrup to deliciously flavored selections like Maple-Butter, Winter's syrups are sure to please. Try them on Pancakes, waffles, biscuits and French toast or go all out and pour some over your favorite ice cream. The generous sized 25 oz. Country style bottles look great on the shelf!